I like the twist you added and I really like it without a border. 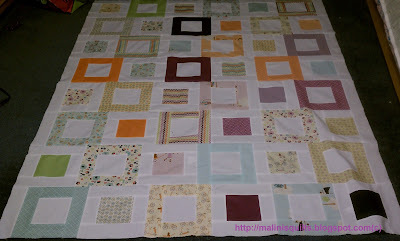 I might even do a scrappy binding. I have never done a scrappy binding. It sounds fun but for some reason scared of it. Should give that a try. I would add a small strip a the top and bottom to balance the one on the sides, but I tend to be overly symmetrical. That sounds like a great idea. I totally agree with you on the symmetry. Thank you, Helen! I love it too :-). Looks like more votes for scrappy binding :-). Great design! A bit of extra white might add to the illusion of the tumbling blocks but it would still look finished and self contained without it. Thank you, MC! It was fun to figure that out :-). I might just add a white strip to the top and bottom and leave the sides as is. It's fabulous as it is but some white borders would give you more space for some of your amazing FMQ;-) I LOVE the colors, so sweet!!! Thank you, Alice! Yes, it does sound good. Thank you, Doreen. Looks like everyone is going for scrappy binding. Will definitely give that a try. I'm with both Jen and Gretchen - scrappy binding would be great and it's not hard at all! Nice looking quilt! Thank you, Janis! Yes sure will try out the scrappy binding. I agree with those that said top and bottom but not the sides. Good luck - it's a beaut so far!